President Petro Poroshenko urges the international community to mount pressure on Russia. Ukrainian film director Oleh Sentsov convicted on the trumped-up charges of terrorism and held in a Russian penal colony has announced a hunger strike as of 14 May 2018. His lawyer Dmitriy Dinze talked to the Russian news website Mediazona after visiting Sentsov in the White Bear colony in the Yamalo-Nenets Autonomous Okrug. "I, Oleh Sentsov, a citizen of Ukraine, who was illegally convicted by a Russian court and held in the Labytnanga colony, have announced an indefinite hunger strike as of 14 May 2018. I will only stop it if all Ukrainian political prisoners held in Russia are released," Sentsov said in a letter he had sent through his lawyer. According to Dinze, his client has been preparing for the hunger strike for about a month and a half by refusing parcels, limiting food consumption and preparing his body. "They tried to persuade him to stop a hunger strike in the colony, representatives of the human rights council under the Federal Penitentiary Service visited him. He answered that the hunger strike would last until he wins: either he dies or his demands start being met. He did not demand his own release. He was only talking about the release of political prisoners," the lawyer said. Sentsov was taken to a solitary cell where his health is monitored by a doctor. 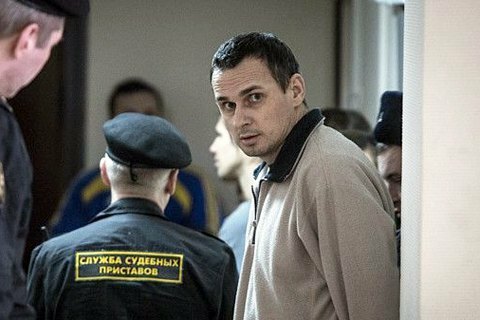 In 2015, a Russian court found Crimean resident Oleh Sentsov guilty of setting up a hang, carrying out two assaults and plotting another two. He was convicted to 20 years in a colony. Another defendant in the case, Oleksandr Kolchenko, was sentenced to 10 years in a colony. Ukrainian President Petro Poroshenko called on the international community to continue mounting pressure on Russia to secure the release of all illegally detained Ukrainians. "I'm calling on the international community to continue putting pressure on the Kremlin so that Ukrainian political prisoners could return home to their families as soon as possible. We continue fighting and doing our best to secure the release of all illegally held Ukrainians detained in occupied Crimea, Donbas and Russia," he said on Facebook.